This sharp bend in the Stillwater Scenic Trail just south of the Stillwater Viaduct Bridge is the likely site where two trains collided head-on in 1894. Some long-time residents of the area may remember the days when Smithfield had a railroad. The tracks opened in 1873, and for nearly a century they carried freight and passenger trains between Providence and Massachusetts. 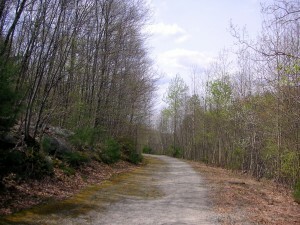 The rails were abandoned and removed in the early 1960s, and today portions of the old rail beds are still in use as walking trails. One in particular is the Stillwater Scenic Trail that runs for almost a mile along the Woonasquatucket River from Capron Road to Farnum Pike. Those who walk this trail generally do so unaware that more than one-hundred years ago this stretch of the line was the scene of a head-on collision between two trains that left dozens injured. Safety concerns along the rail lines had been an issue since the tracks opened. However, this wreck was not the result of some failed regulations or defective signal device; it was caused by simple human error. The incident began on the afternoon of June 12, 1894, when a northbound train left Providence for Pascoag at 4 p.m., while at about the same time a southbound train left Southbridge, Massachusetts, for Providence. Both trains were carrying freight and passengers. Smithfield had four railroad stations; Enfield, (Later called Esmond), Georgiaville, Stillwater, and the Smithfield Station located on Brayton Road near Farnum Pike. The Stillwater Station was located on Capron Road, next to the Woonasquatucket River. Farther to the north was the Stillwater Woolen Mill, as it was known at that time, where a spur of railroad track ran behind the mill where trains could be loaded and unloaded. (This mill was known by several different names over the years until it burned in 1984.) This spur could also be used to allow trains headed in opposite directions to pass each other by allowing one train to detour off the main line until the other had gone by. The detoured train would then back off the spur and continue on. There were many train stations between Southbridge and Providence, one being the Tarklin Station in eastern Burrillville, which the southbound train would need to stop at on its way to Providence. A telegraph message had been sent to the Tarklin and Stillwater stations relating that the two oncoming trains were to pass at Stillwater, and that the northbound train was to have the right-of-way. The station operators were instructed to relay this information to the conductors of each train. Telegraph messages were transmitted in Morse code, which utilized a series of dots and dashes that represented individual letters of the alphabet used to form words. Unfortunately, for reasons never determined, the station operator at Stillwater misunderstood the message, and thought the trains were to pass at the Smithfield Station farther up the line. Why the operator would have thought this to be the case is unclear as there was no spur at or near the Smithfield Station that could have allowed the trains to pass. When the southbound train reached Tarklin, the crew was instructed to detour off the mainline onto the spur at Stillwater. The southbound then continued on to the Primrose Station in North Smithfield, and then to the Smithfield Station where it stopped to discharge passengers. At about the same time, the northbound train arrived at the Stillwater Station where the crew was erroneously told that the track ahead was clear until the Smithfield Station. This critical error led to disaster. Both trains proceeded onward with each crew believing the track ahead to be clear; the southbound traveling at 20 mph, and the northbound moving along at a leisurely 12 mph. One newspaper account related that the two trains met on a sharp curve close to a steep embankment which accurately describes the area just to the south of the Stillwater Viaduct Bridge which spans the Woonasquatucket on Washington Highway. Apparently the collision was so unexpected that the crews of each train didn’t have time to react, either by applying the brakes, or by jumping to save themselves. Each train, weighing thousands of tons, plowed into the other, the faster moving southbound inflicting more damage. The horrific sound of screeching metal and splintering wood followed by shouts and screams echoed up and down the small valley alerting nearby residents of Stillwater that something awful had happened. Miraculously there were no explosions or fires as a result of the collision. Each train was pulled by a coal-fired steam locomotive which operated by burning coal, to heat water, to create steam, which powered the engine. In such cases it was not uncommon for a boiler to rupture allowing scalding steam to roast injured crewmen alive, or for red-hot coals to ignite wooden portions of the train. This small bit of luck no doubt prevented the accident from being much worse. In 1894, the only fire company in Smithfield was in Greenville, and their apparatus consisted of a horse-drawn, hand-pumper, which was too far away to be of use if it had been needed. Numerous people lay injured in the wreck, the most serious being the crews of each train. John Sewall, the fireman aboard the northbound suffered the worst injuries: two broken legs, both arms crushed, and internal bruises. It was reported that he was not expected to survive. However, research has revealed that he is not listed in either Smithfield or Providence death records so one has to wonder, did he survive, or was this a case where each community thought it was up to the other to record the death? Conductor Ballou of the Providence train also suffered severe injuries, but he too apparently survived. Other crew members of each train suffered broken bones, severe bruises, cuts, and scrapes, but all recovered. Each train had been carrying about twenty-five passengers, all of whom were reported to be “shaken up” from being tossed about in the wreck, but fortunately their injuries were not life-threatening. At the time of the accident, the tracks were owned by the New York & New England Rail Road, which kept a “wrecking train” in Providence for just such an emergency. The wrecking train was a disaster response vehicle for the railroad that carried necessary rescue and repair equipment, as well as medical personnel to treat the injured. When word of the crash reached the city, the wrecking train was immediately dispatched, along with a second train to bring the injured and other survivors to Providence. The salvage crews worked throughout the night to clear the tracks so service could resume the following day, for as long as the tracks were blocked, the railroad was losing money. By 9 a.m. most of the wreckage had been pushed aside to allow trains to pass, but clean-up and complete removal of the debris no doubt required several more days. The crews worked quickly, for train wreckage along the line was not a good advertisement for railroad safety. Unfortunately, this wasn’t the first railroad accident to occur in Smithfield, nor was it the worst, nor was it to be the last. However, it serves to illustrate how one mistake can affect the lives of many others. Filed Under: Articles Tagged With: New York & New England Rail Road Accident, Rail Road History Rhode Island, Railroad History Rhode Island, Rhode Island Train Wreck, Smithfield R. I. Railroad, Smithfield R.I. Train Wreck, Stillwater Station, Stillwater Train Station R.I.